Margarita’s, fajitas, beaches, bars and tequila maybe the things that spring to mind when thinking about Cancun. The Mexican holiday mecca offers all of the above and much, much more. It is a great place to be based for a beach holiday and to enjoy a vibrant nightlife, along with exciting day trips and adventures all on the doorstep. 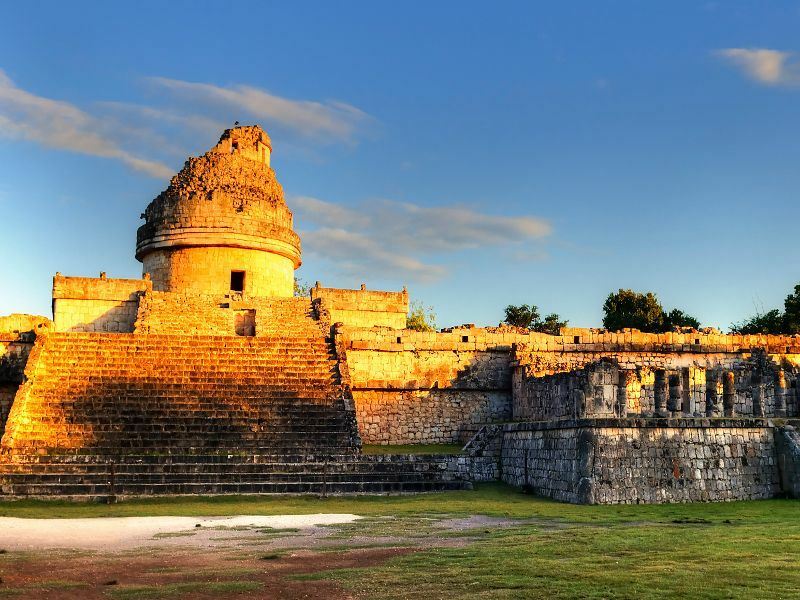 Take a day trip to the Mayan temples at Chichén Itzá, a two and a half hour drive from Cancun. Choose a guided tour or grab a map and explore by yourself. 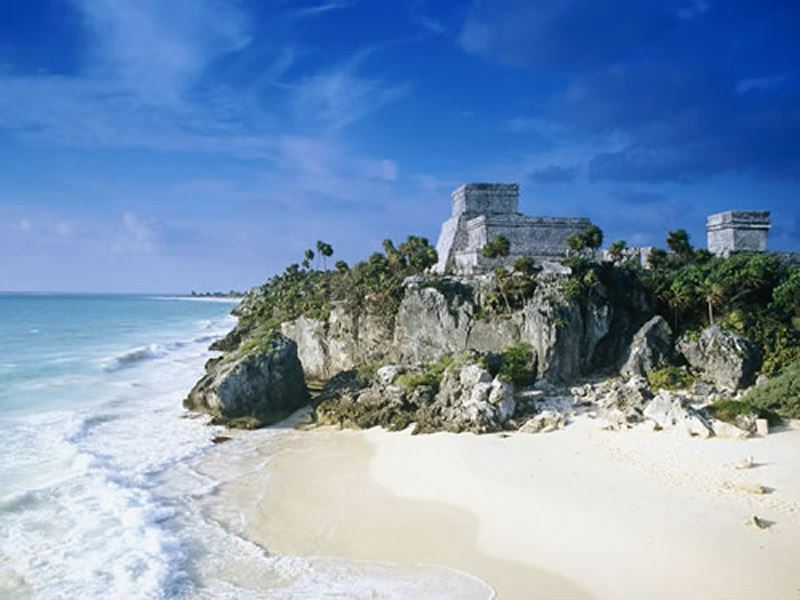 The site is huge; one of the highlights is the Kukulkan Pyramid or El Castillo, as it is also known. This incredible stone structure stands at 24 metres in height, has 365 steps and is one of the new Seven Wonders of the World. The Mayan’s were extremely intelligent, had their own calendar and were dedicated astronomers. Make sure to wear flat shoes and take a hat, water and sun cream with you on the day. If the opportunity arises jump in one of the limestone sinkholes or cenotes nearby to Chichén Itzá, it’s a great way to cool down after exploring the temples. Another excursion not to be missed is to the gorgeous island of Isla Mujeres. Hire a golf buggy or scooter and zip around the tiny island, at just over four miles long it can be easily explored. The island has a small town with pastel coloured buildings, very friendly locals, and lots of character. From Cancun jump on the tourist bus to Playa Tortugas, Playa Caracol or Elembarcadero to catch a boat across. There are plenty of waterfront restaurants for a nice meal by the sea, head to the northern end of the island, which is within walking distance from where the boats drop off and pick up for some stunning beaches. Visit Charlie’s bar for a cold beer right on the beach. Isla Mujeres has a turtle hatchery and from May – September it is possible to swim with whale sharks from the island on organised trips. Tulum is the place to go for Mayan ruins right on the beach, azure waters, white sands and Mayan ruins right next to all of this. It makes for an interesting day out with a combination of sightseeing and sunbathing. It is also a great area for diving and snorkelling and has plenty of beach bars and restaurants to chose from. It could be worth staying the night in a beachfront bungalow and watching the sunset over the ruins. Xplore is another option for an action packed day, zip line above the treetops, hit the jungle in your own amphibious vehicle, swim through caves full of stalactites and paddle on rafts along a river. Stay a full day here with changing facilities and restaurants to refuel after the adventure! To get right back to nature go on a kayak or boat tour through the Sian Ka’an Biosphere reserve. Paddle across lagoons or float along mangroves, there’s an opportunity to spot manatees and an abundance of wildlife makes this a peaceful day out. 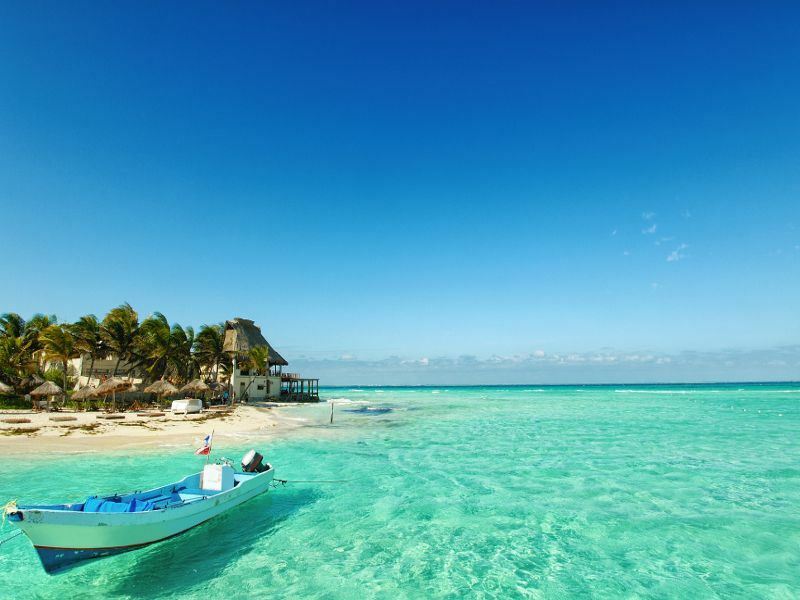 For scuba diving the island of Cozumel is a popular choice, with plenty of trips and boats to choose from. Snorkelling, glass bottom boat trips and deep-sea fishing are among the other activities to be experienced here. Back in Cancun there are plenty of water-based activities to keep you busy from parasailing to jet skiing or have fun at the Wet n Wild Water Park located in the Hotel Zone. If that all sounds like too much then simply kick back with a cocktail and catch some rays. For more relaxation Cancun has many options from spas to yoga sessions, try a Temazcal. This traditional Mayan steam bath is supposed to have healing properties and good for ultimate relaxation. For shopping there are a few malls dotted along the Hotel Zone selling all sorts of interesting goodies including the mandatory souvenir sombrero! Cancun has a huge amount of dining options; Mexican food is of course a must! La Destileria serves up very tasty Mexican dishes and the perfect setting to boot, watch the sunset over the lagoon as you sip a margarita. For something a bit different the CasaMagna Marriott Resort’s Japanese restaurant Mikado is a cool place for a special night out. A chef prepares and cooks food right at the table and plays around with some flames too! For a romantic evening the lobster dinner cruise will tick all the boxes. Step aboard Columbus a Spanish galleon and set sail into the sunset with live music, food and wine. Located within the Hotel Zone it makes for a great end to a fantastic holiday. Even if you are not into staying up late the nightlife in Cancun must be experienced at least once. The Hotel Zone has a huge array of fancy bars and sparkly nightclubs. Coco Bongo hold nightly shows with amazing performers who swing from the ceiling and fly through the air. Señor Frogs is a fun bar to have a drink at with crazy cocktails served in giant souvenir glasses, and there is even a waterslide into the lagoon! Dady’O is a huge nightclub with laser shows, DJs and dancing until the early hours of the morning. Cancun has it all, so pack those bags and head to paradise! More information and to book: Boasting stunning white sand beaches, warm Caribbean waters and an infectious merry spirit, Cancun can be the place to party all night or the place to chill all day.